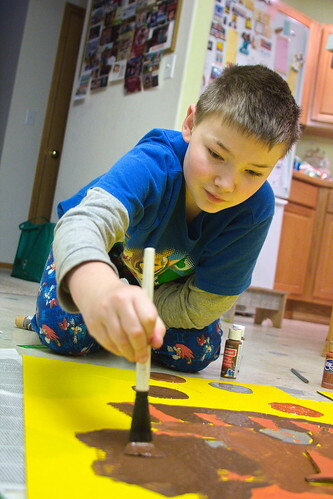 Artist at work, a photo by The Bacher Family on Flickr. Daniel's latest project for school was to create an African mask and shield. We bought him a large sheet of cardboard and some paints, and when he told me he was going to start working on the project, I said OK, I'll come downstairs and help you with it in a little bit. When I walked in ten minutes later he was already deep into the project, sprawled on the kitchen floor. My favorite photo from the set was this one, using forced perspective to emphasize the reach of Daniel's arm as he puts the final touches on his work. Sometimes the right perspective is the most important thing to look for when you're photographing a subject. Do you get in close and use a wide angle, or do you stand back and zoom in? Each has its own advantages and disadvantages and alters the look of the scene in different ways. I'm pleased with the choice of close up and wide angle on this shot.